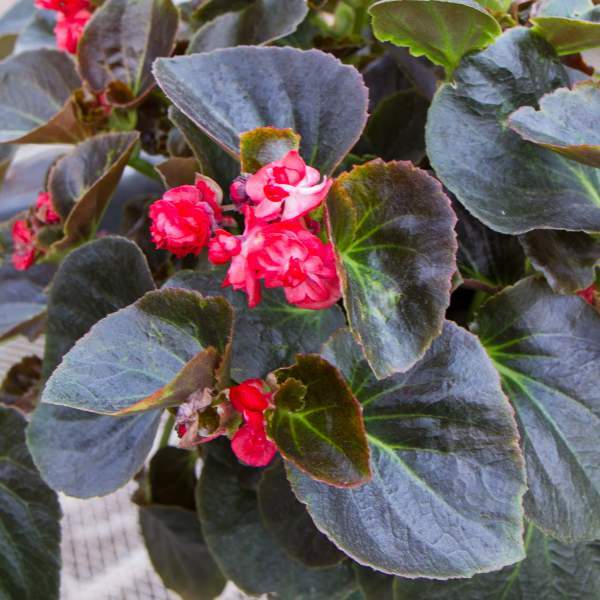 Double Begonias are native to South and Central America, Africa, and southern Asia, liking the moist climate of a sub-tropical or tropical environment. This means that although the begonia is a simple plant to care for, choosing the right location and watering them properly (moist soil, but not too wet) is essential to success. Lady Carol Red has bronze foliage, and the double-flowered rosette blooms are red. They are best grown in containers as house plants or for partial shade landscape use. For best results with Double Lady Carol Red, we recommend using a constant feed program of 200 ppm N. Maintain a pH between 5.5 - 6.2. Allow soil to dry slightly between watering. We recommend that you pinch Double Lady Carol Red 5-10 days after transplanting to your final container. Additional pinches every couple of weeks may be required to shape your final pot. Remember to give your double begonias 4 weeks from their final pinch to reach bloom stage. Begonias should be spaced adequately to allow airflow and light penetration between the foliage. Usually 2’ centers on baskets will be enough. In our experience, plant growth regulators will stop growth completely in double begonias (keeping them from ever growing again). Proper pinching is the best way to control height. Aphids can be attracted to Double Begonias. Double Lady Carol Red are not prone to many diseases, but watch for botrytis and plant rot while the days are short. Botrytis is a grey rot usually associated with wet or humid conditions. You can prevent it by allowing the plant to dry out between waterings, allowing for good airflow in your greenhouse, and spacing to allow the sun to penetrate to the soil level. The most common chemicals used to treat botrytis are Medallion and Banrot. Use them as a drench according to each label’s instructions. 1. We recommend planting 4 starter plants per 10 inch basket. Use a well-drained soil in your baskets and plant your starter plants deep, allowing the ellepot to be completely covered by the soil. If you are planting 4” pots, 1 plant per pot should be sufficient. Plant it directly in the middle of your pot. 2. Pinch Double Lady Carol Red 5-10 days after transplanting to your final container. Additional pinches every couple of weeks may be required to shape your final pot.